"Sir Alex Ferguson was arguably the best manager in the world. I'm honoured to have been given the chance to become his assistant manager all those years ago. They would certainly be big shoes to fill, but I feel like the experience I have had with Everton and with the fans have bettered me as a person and bettered my credentials as a manager. I have a contract with Everton, and I intend to see it out- but if I was approached by Manchester United I would have to consider it." "It isn't often you get given the chance to be such a big part of one of the biggest clubs in footbal history. It's the sort of opportunity you cannot afford to let pass as a manager." he added. "We are in a good situation at the moment, but we always strive to do better. We need to make sure this is a club that its members and fans can be proud to be a part of. Any appointment made will be conducted with that in mind. We have ambitions in Europe and consistency in domestic affairs that we want to pursue. 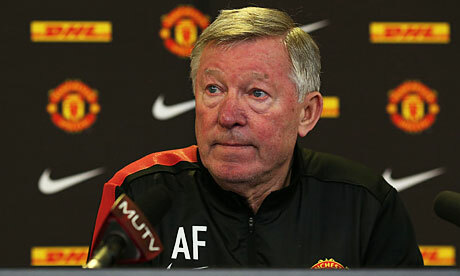 Following Sir Alex's departure- it is also important that we pursue this in the right way.." he said. "You think I can be- will be manager of Manchester United? Maybe, but I don't think so. I don't think so. I am committed to my contract here. There is unfinished business," he said. @KingPadster: Thanks, got some (un)expected news coming up. @k1rups: Thanks a bunch, I really appreciate the following. An apparent news leak from the Manchester United higher-ups has caused a stir in the tabloids following the managerial saga. David Gill's son, Oliver, was allegedly believed to have leaked that 'goal-getter to get the job' on a social networking site. Oliver Gill was a former player for Manchester United, and after making solid progress through the youth and establishing himself in Manchester's reserve side- he turned down a contract offer to enroll at Durham University. The aftermath sees Ole Gunnar Solskjær soar in the bettings. Since departing his post as reserves manager, Solskjær has led his native Molde to back-to-back titles in Norway. His exploits both on and off the field would be well-recieved by all Manchester United fans. Who better to carry on the work of Sir Alex Ferguson than the baby-faced assasin that played under and understudied him? Is it Gunnar be Solskjaer? Great update and awesome writing! You two are like my loyal customers. Éric Cantona has been announced as the successor to Sir Alex Ferguson's reign and will take charge of the club on the 10th of July, 2012. The news has come as a considerable shock to the public, as Éric has no real managerial experience- save for a stint as France's National Beach Football Team's coach. He also holds the role of 'Director of Football' at the recently rebirthed New York Cosmos. Cantona has something of a cult hero status amongst the Red Devils supporters after playing a key role in the revival of Manchester United as a footballing force towards the end of his playing days. He iconically donned the #7 shirt that Best, Robson before him, and Beckham and Cristiano Ronaldo after him had also worn. His footballing exploits were often marred and offset by a poor disciplinary record. He is believed to have matured since his playing days. But with the array of more capable, proven managers available for pursuing, some fans are even bewildered by the appointment and see it as a sign of Manchester United's downfall as well as Manchester City's dominance. David Gill however, had plenty to say on the matter: "After the lengthy period of time at which Sir Alex had been involved eith the club, the change in managers was always going to signal a new era. We feel that out of all the choices we had, Éric best met and exceeded our ambitions. He has a good clear idea about how he wants to take the club forward and we believe he has the determination and conviction to succeed. It wasn't an easy decision, and Éric has been given a short-term contract dependent on how well he meets the objectives we have for the coming season. If we feel that the Club is moving in a good direction, we will look to negotiate a longer-term. These are exciting times for me as a fan of the club, as it should be for all of us." Cantona is believed to have signed on a deal worth £3,000,000. You would think Sir Alex himself would be in-the-know regarding the appointment of Cantona as his successor, but a recent engagement with the press revealed that even he had heard little about it. The flambouyant French forward was signed from rivals Leeds in 1992 and enjoyed years of exciting success under Ferguson before his retirement from professional football in 1997. "To be perfectly honest with you, I didn't think something like that would happen. I had gone with Gill to speak to Solsjkaer only days ago so this comes across as a surprise to me also. I was aware he was on the list but I couldn't see any real reason for him to express interest in the job. Perhaps some deals were better left out of the public eye. It's an interesting appointment, but I know Éric is a passionate man and he will deliver his utmost for the club." said Ferguson, newly appointed as a Director. "It is exciting though, to find out what he hopes to bring to Manchester. He's a bloody crazy lad after all, so you can expect things might liven-up around here, especially in the press conferences!" Ferguson added as a joke. "It was a great opportunity for me to engage and still be a part of the running of a club that I hold very dear to me. I will treat this job just as I have my managerial post and look to deliver nothing but the best in terms of moving forward."